Hobo International reminds us of the power of some perfectly placed pleats with its Wren Clutch. 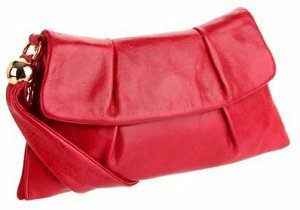 The artfully placed pleats emphasize the quality of Hobo International's rich red leather. The Italian top-grain skin is first rate, and made extra appealing after Hobo International's tumbled it. This technique gives it that beautiful, broken in look that usually only comes with age. The Wren's minimalist appearance make it perfect for making the day to night transition, and its size supports that styling. It's larger than most after-five purses, but quite manageable thanks to the soft wrist strap and zippered pockets. One obvious pocket is inside, but the other is hidden discreetly at the side of the bag. This secret compartment is the perfect place for stashing valuables! I wish the wrist loop was removable, as I think the Wren looks cleaner without it, but this is a minor quibble. I'm also not so sure about the golden bead which adorns it, but it's so discreet that I can't criticize it too much. At least the loop will make carrying a bit easier once the Wren's packed to capacity. At $138 the Wren is well priced for a bag of such substance and versatility. Look for it in red, orchid, or basic black. The peony printed Hobo International Wren bag, a patterned alternative to this pleated bag. It’s awesome to pay a quick visit this web page and reading the views of all friends about this article, while I am also keen of getting know-how.